On Jan. 18, as part of this year’s Dr. Martin Luther King Jr. Realizing the Dream celebration, ABC News “Nightline” co-anchor and Emmy award-winning journalist Byron Pitts delivered an inspiring address to an overflow audience in Sellers Auditorium in the Bryant Conference Center. Since 1990, The University of Alabama has joined Stillman College, Shelton State Community College and the Tuscaloosa Southern Christian Leadership Conference (SCLC) to celebrate King’s legacy. 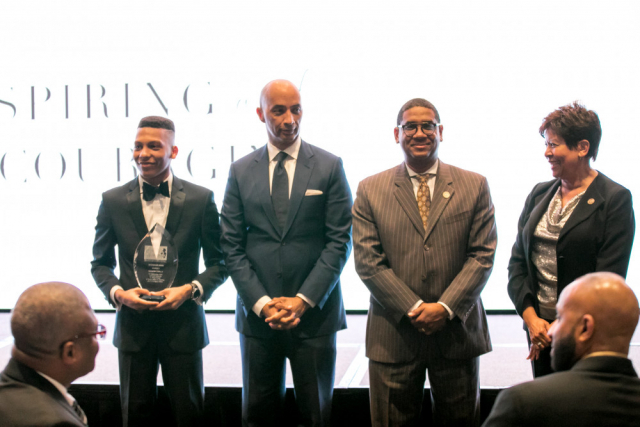 For the past 11 years this celebration has included the Legacy Awards Banquet, which features a keynote speaker and recognizes three community members who embody the servant leadership of King. 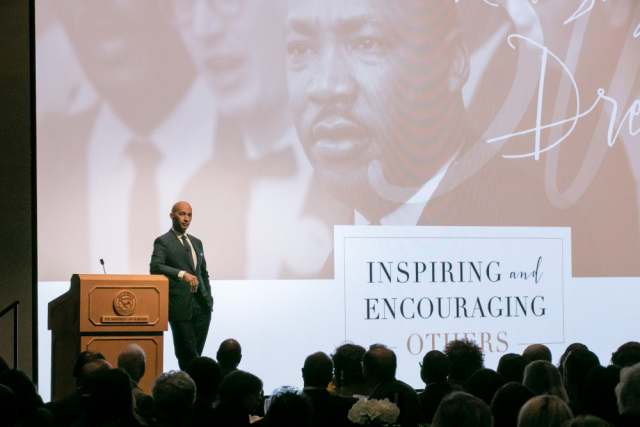 This year’s theme, “Inspiring and Encouraging Others,” was selected to motivate people to look for ways to serve, like King, through brave actions and timeless words. Pitts transfixed the audience with his life’s story. He credited the faith, love and support of his single mother for his success, despite doctors having diagnosed him as a child as being mentally retarded and as one would never be able to live on his own. Recalling how people reached out to him and his family, Pitts challenged the audience to get involved in service to others, especially children in need. He credits his faith and hard work for being able to overcome these early problems, allowing him, as a network level journalist, to cover three wars, interview seven presidents and travel to 97 countries. Following Pitts’ address, the honorees received their awards. 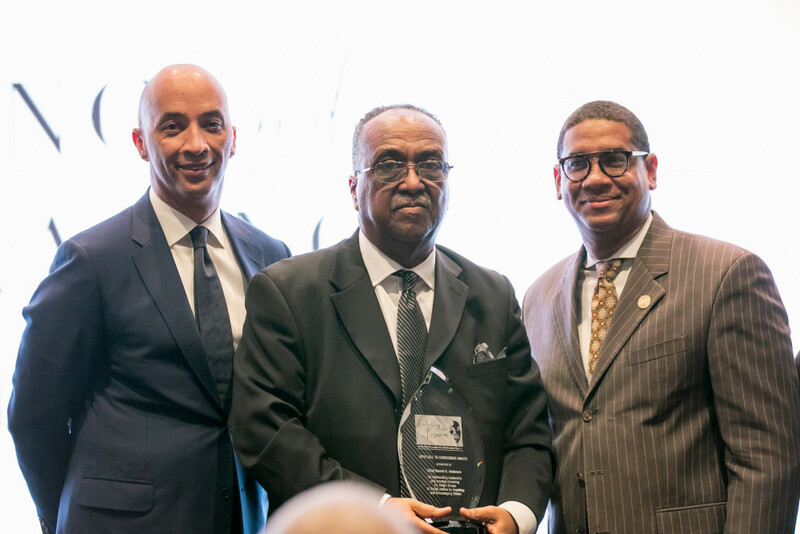 Quinvarlio S. Kelly Jr. received the Horizon Award for his all-around community involvement. Tuscaloosa Police Chief Steven D. Anderson received the Call to Conscience Award for helping Tuscaloosa become a safer city by building relationships among the police, teens and the community. The Rev. 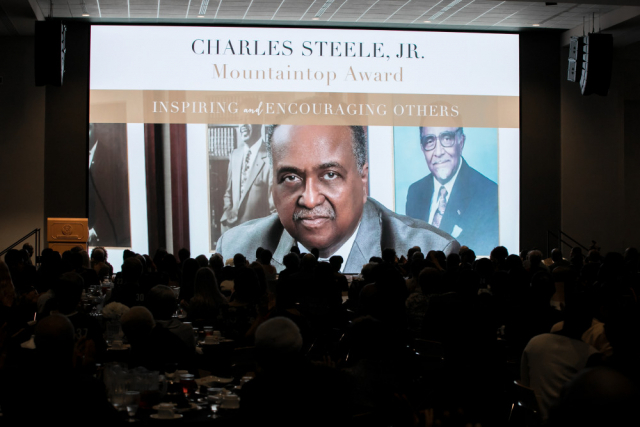 Charles Steele Jr., who currently serves as SCLC president and CEO, received the Mountaintop Award. The 2018 graduate of Stillman College is active in his community spiritually, civically and politically and as an advocate for Child Abuse Prevention Services. Kelly focuses on empowerment by recognizing the value of diversity and different perspectives. “Being a student at [Stillman] has really opened my eyes to a lot of things. 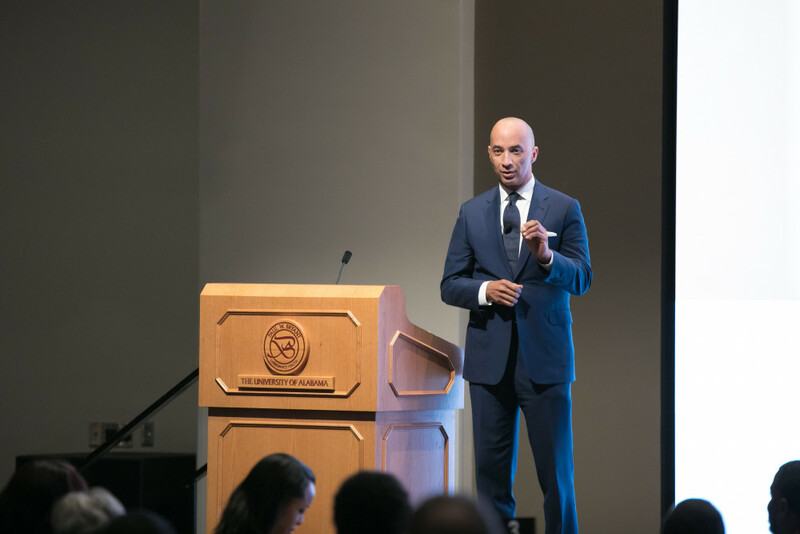 Schools like these really prepare their students for leadership.” Kelly gave credit to his alma mater for opening his eyes to opportunities for leadership and civic engagement. “We’ve gotten away from the values of respecting each other as individuals, as equal, and it’s something that’s gone on forever.” He promised to be part of a generation that makes sure each person they come in contact with knows they are equal. 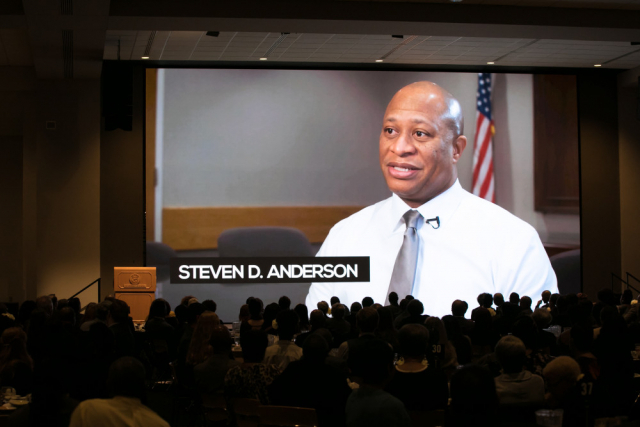 As a black police chief in Tuscaloosa, Anderson acknowledges being a recipient of the work of civil rights leaders like King and therefore encourages young people by teaching them to value life and take advantage of opportunities. “We have to get back to being civil with one other. I think we have lost our way as far as civility goes,” said Anderson, who has spent his entire police career at the Tuscaloosa Police Department. Anderson said the black community has too many who don’t value education enough. “They don’t place enough value on the things that people of prior generations fought and died for, so that they could have the rights that they currently possess,” he said. Steele is president and CEO of the Southern Christian Leadership Conference. He is a former Tuscaloosa city councilman and Alabama state senator. Steele was cited for leadership that has led to community improvements in home ownership by minorities, drug prevention and treatment, and recruitment of new industry to Alabama. “Because of the human aspect of who we are, people are so competitive toward power and discriminatory practices. They always want somebody beneath them. They want somebody to serve them,” said Steele, who urged people to adopt the style of Dr. King — leading by being a servant to others. 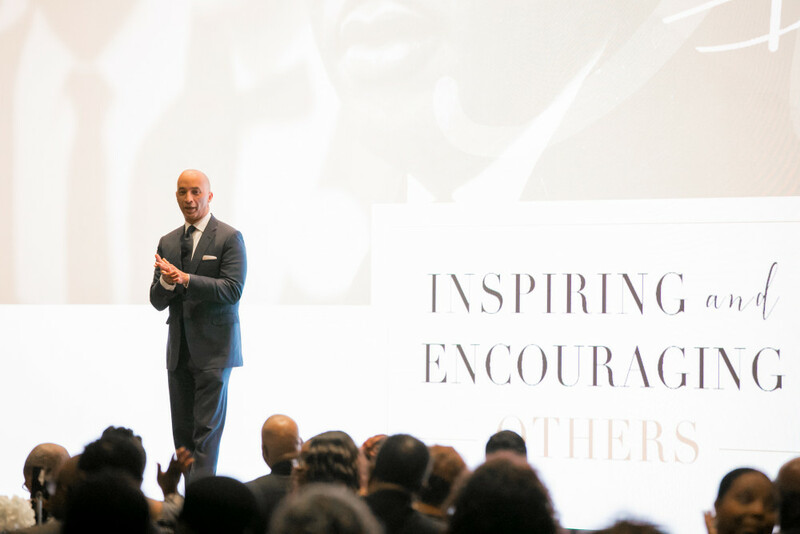 For a full transcript of Byron Pitts’ talk, click here.